Eleven years ago, Jem Catterick and Ralph McLeary fell deeply in love. They thought it would be forever, that they’d found their happy ending. As everyone agreed, they were the perfect couple. Then two became four, an apartment became a house. Romantic nights out became sleepless nights in. And they soon found that life wasn’t quite so simple anymore. But through it all, Jem and Ralph still loved each other, of course they did. 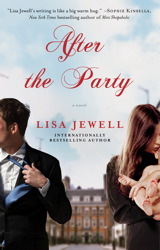 AFTER THE PARTY is a delightful story about the power of starting over. The twelfth anniversary of Ralph and Jem’s first kiss falls upon a cool, paper-dry Wednesday at the beginning of March. The wisteria outside Jem’s office window has yet to yield its cascades of perfumed lilac blooms and the hydrangea by the front door is stubby and only just turning green—spring feels a long way off although it is just round the corner. Mariel smiles sympathetically, and Jem closes the door behind her. The sad irony of a trip to Almanac Road on such an auspicious date is not wasted on her. She is painfully aware of it as she walks the fifteen minutes from the office on Wands-worth Bridge Road. When she gets there, she glances down, as she always does, into the basement pit of the house at number thirty-one. Terra-cotta tiles gleam, newly laid and freshly mopped. Three small trees carved into pom-pom balls of varying sizes sit in shiny cobalt-blue pots. The front door is thickly painted in a matte shade of mushroom and dressed with nickel-plated knobs and knockers. Through the window she can see more mushroom paint on walls hung with black-and-white photography. Suddenly, two small hands and a baby’s head appear over the top of the sofa. Jem smiles. The baby smiles, then disappears again. Someone else lives here now. A young family, a house-proud family with enough money to renovate the run-down flat they’d bought a year ago, and enough foresight to have done it when the lady of the house was four months pregnant with their first child, unlike Jem, who had spent the last night of her first pregnancy on a mattress in the dining room of her sister’s flat, her possessions piled around her in gigantic cardboard boxes, like a township, waiting for a woman in Camberwell to sell her flat to a man in Dulwich so that the owner of their new house in Herne Hill could sign the completion forms and hand them their front door keys. Before the very neat and well-organized family lived here, a scruffy woman with a deadbeat teenage son and three obese cats had lived here. And before the scruffy woman with the fat cats, a young couple with matching bikes and raincoats had lived here. And before the smug, outdoorsy couple with the bikes, a man called Smith had lived here, alone, having an existential crisis that led, eventually, to his retraining as a Reiki teacher and relocating to San Francisco. And even longer ago than that, years before the man called Smith had lived here alone having an existential crisis, Smith’s best friend, Ralph, had lived here with him. And so, for a very short while, over twelve years ago, back in 1996 when Oasis was the most famous band in the country and football was, supposedly, coming home, when she was a child of only twenty-seven, had Jem. Jem can feel it, even now, as she stands on the pavement, peering through the window at strangers’ mushroom walls—she can still feel the electric jolt of sudden promise, the thrill of new beginnings. She feels it for just a moment, and then it passes, because for some strange reason things have not worked out how she thought they might during those long-ago days and now it’s just a dull echo of a moment in her life when fate, chance and destiny all came together and took her somewhere quite remarkable. A small shiny object leaves his hand and hurtles toward her, catching the light as it falls, landing on the pavement within an inch of her toes. “Let yourself in!” The large hands slide the noisy window back into place. Jem tuts and picks up the keys. She climbs the front steps and prepares herself, mentally, for the next half hour of her life. She picks her way through the debris of Karl’s life: forgotten T-shirts, a broken guitar, a shopping bag full of recycling, and, oh, God, a pair of underpants. She finds him on the sofa, eating a ham sandwich and watching an old episode of Murder She Wrote. “I thought you said you needed bread?” she says, waving the loaf of Warbutons Malted she took for him from her own kitchen cupboard that very morning. “You’re welcome,” says Jem, lowering herself onto the very farthest edge of a grubby yellow armchair. “What happened to the cleaner?” she asks, looking around the room. “How’ve you been?” Jem squints slightly as she asks the question, almost not wanting him to answer it. Karl rearranges his large form on the sofa, so that he’s facing her. “Oh, you know, the parties, the premieres, the hot dates, it never ends.” He looks old. Not a line on his face, not for a man of forty-seven, but his face looks dead, as if someone has taken a sheet of sandpaper to him and scoured away all the gloss, all the glitter. “What you got in there?” he asks, eyeing the folder skeptically. He winks. “Maybe I need a new agent,” he jokes. Jem sighs. Jem is Karl’s agent, and Karl’s joke (this is not the first time he has made it) is not funny anymore. She takes out a letter that arrived this morning, printed on sky-blue paper. It is confirmation of a phone call that she had last week with a production company that is filming a series of interviews with “controversial” celebrities. Karl puts the paper down on the sofa and picks up his sandwich. He stares at it disconsolately for a second. “If that’s what I want,” he says, so quietly that Jem only just hears him. Click on over to our “Free Reads” section (see it? right there in the upper right corner?) to start reading AFTER THE PARTY today. And if–as we bet it will–it makes it to your keeper shelf, you can purchase the book at the links below. Happy reading! Jem and Ralph's story begins in the delightful RALPH'S PARTY...now find out what happens after the happily-ever-afters!